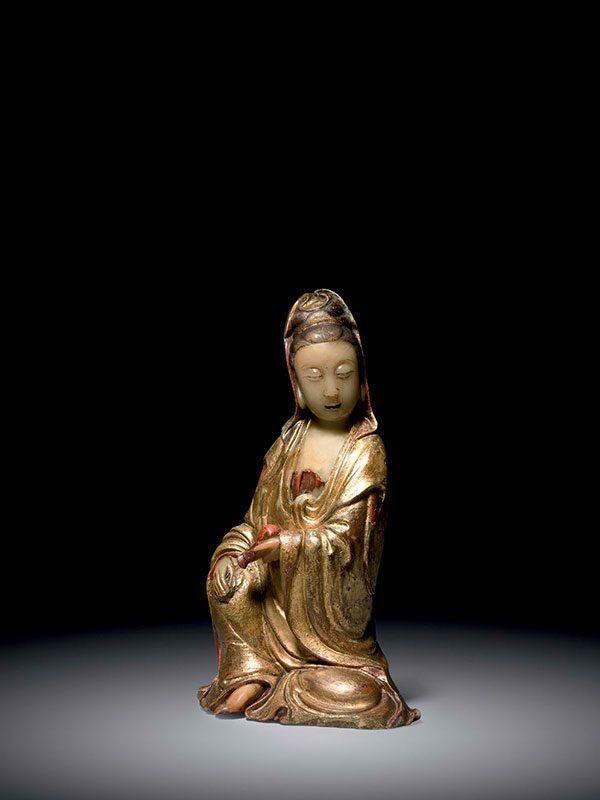 A soapstone figure of Guanyin, seated in the so-called ‘royal ease’ position. Her body is dressed in loosely fitting robes that fall open at the chest and leave both her hands uncovered. The right hand rests on her drawn-up leg with exposed foot, whilst the left hand holds a water vase. The head is downcast slightly; her neatly arranged hair is held in place by a tiara and is covered by a cowl. The robe is delicately incised with detailed cloud, wave and flower patterns. The soapstone is of translucent creamy-ochre colour, which can be observed on her face, the revealed chest, both hands and the right foot. The robe retains large amounts of original gilding and red pigments, whilst her hair is painted in black. The base is covered in a layer of red paint.